Why Hasn't the GOP Treated Fort Hood Like Benghazi? Before there was Benghazi, there was Fort Hood. 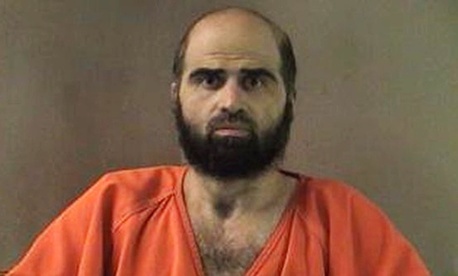 In November 2009, Army Maj. Nidal Malik Hasan killed 13 people and injured 30 more on the sprawling East Texas military base. Since then, a debate has raged about whether Hasan, who some believe was influenced by a radical Islamic cleric, committed an act of domestic terrorism or whether the incident was an episode of "workplace violence." The Obama administration has long maintained the latter—that there wasn't enough evidence to show that Hasan acted with a political motive. Plenty of Republicans have disagreed. Yet, unlike Benghazi, there's never been a concerted push in the House to probe more deeply into the possible intelligence and investigative failures that might have led to the tragedy despite the still-unanswered questions about the nature of the threat Hasan posed. In forming the select committee to probe Benghazi last week, House Speaker John Boehner talked about a terrorist assault that raised questions of "truth" and "accountability." Those issues, too, remain at the heart of the attack at Fort Hood. Both episodes involve a failure by the government to heed signs of an impending attack. Both speak to the nation's readiness in the face of a potential threat. And in both cases, the White House was initially reluctant to classify the act as terrorism. Yet only Benghazi draws the headlines and cable-news outrage, having become an almost obsessive topic for House Republicans. Before the select committee, the House had already launched eight separate probes of the attack on the diplomatic outpost in Libya. The number of GOP deep-dive inquests into Fort Hood? Zero. Moreover, legislation seeking to reclassify the incident as a terrorist act and to award combat-related Purple Heart benefits to the victims has been stalled for years. There is one clear difference between the two incidents: Benghazi affords the GOP a chance to make life more difficult not only for President Obama but perhaps also for the Democrats' future presidential nominee, Hillary Clinton. The chain of fault with respect to Fort Hood is muddier, reaching back into the George W. Bush administration. Plus, drilling deeper into that affair would force Republican leaders to openly take on the Pentagon, which opposes any legislative attempt to compensate the Fort Hood wounded as victims of a terrorist attack or to paint Hasan as a terrorist who was hiding in plain sight. "They've fought this every step of the way," said Rep. Frank Wolf, R-Va.
With Republican leaders unwilling to push the issue, fighting for Fort Hood has been a lonely struggle, involving just a handful of members mostly from Texas, including Rep. John Carter, whose district includes Fort Hood, and Homeland Security Committee Chairman Michael McCaul, as well as Wolf, Tom Rooney of Florida, and a single Democrat, Chaka Fattah of Pennsylvania. Democrats, standing by the administration, have also shown little interest in the issue. Last week, Carter, with the help of Reps. Mike Conaway and Mac Thornberry, both also of Texas, was able to insert some Purple Heart language into this year's National Defense Authorization Act. A similar push last year was first watered down in order to pass the House and then stripped out during a conference committee. In the other chamber, Sen. John Cornyn's bid to include a related amendment in the NDAA was blocked. Last year's effort failed, Virginia's Wolf told National Journal, because of pressure from the military and the administration. In a letter leaked to ABC News, the Pentagon warned members of Congress that approving the legislation would "fundamentally alter the fundamental character" of the Purple Heart award and would "undermine" Hasan's prosecution. More than 100 victims of the shootings and family members filed suit in 2011, asserting that the Defense Department's refusal to classify the injuries as combat-related cost them thousands of dollars in benefits. But the suit was stayed, pending Hasan's court-martial. Hasan last year was convicted on premeditated murder charges, yet the lawsuit still hasn't moved forward. Nor has the military backed off in its opposition to reclassifying the event. Beyond compensation, the lawsuit would have given the plaintiffs to opportunity to review Defense Department and administration documents—and their lawyer, Reed Rubinstein, says Congress still has a responsibility to provide "honest, open, transparent oversight and accountability" for the events leading up to—and following—the shootings. "Nobody wants to revisit it," said Rubinstein, who has been lobbying Congress to act on behalf of his clients. The FBI conducted its own internal probe in the wake of the Fort Hood shootings, as did the Army and the Senate Homeland Security Committee under then-Chairman Joe Lieberman. The FBI investigation, overseen by former Director William Webster, concluded that the bureau failed to act on a chain of emails between Hasan and radical cleric Anwar al-Awlaki which seemed to indicate that Hasan was sympathetic to the Islamic militant cause. The Army's report was heavily criticized for not touching on Hasan's possible political and religious motivations. Neither review sought to establish whether political concerns played into the Obama administration's decision to classify the act as a workplace crime. No investigation ever has—even as the House GOP today is fixated on whether the White House burnished Benghazi talking points in a bid to protect its image. The only effort to date to hold the administration "accountable"—to use Boehner's word—is the bid by Carter, McCaul, and Wolf to force Attorney General Eric Holder to say whether the Justice Department advised the Pentagon against investigating and prosecuting the Fort Hood shootings as a terrorist incident. But even there, after Holder stonewalled them, there's been no attempt to take him to task, as the House GOP did with the "Fast and Furious" gun-tracking scandal. But that was another investigation that promised to show only the Obama administration in a poor light. What went wrong at Fort Hood doesn't break down so neatly along party lines. Which means as a political bludgeon, it's just simply not as useful.